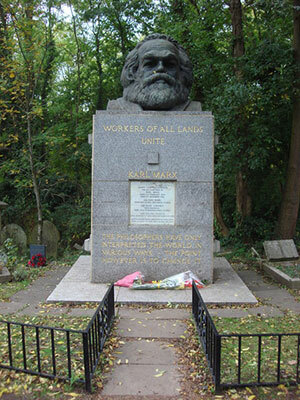 Undoubtedly the most famous resident of Highgate Cemetery East is Karl Marx (1818 – 1883) whose monument attracts visitors from all around the world. Although Marx was German born, he had to flee Germany and settle in London, hence why he was buried here. Marx’s political philosophy has had a huge impact on the modern world. Marx has written a number of books, mostly about his critical stance on capitalism, which is the economy that dominates the western world. A problem of capitalism as identified by Marx is the idea that modern work alienates labourers, which means it makes them feel disconnected from the object they are making therefore it makes it difficult for them to get a sense of their contribution towards society. Modern work is unstable since workers can be let go the minute costs rise or if cheaper technology can be used. Another famous critique against capitalism is that workers get paid very little and instead capitalists (the ruling class) get rich. In the world of business, capitalists often pay workers little for doing something whilst they close deals on selling the same thing at a much higher price. Therefore, Marx believed that the “profit” that capitalists make is actually exploitation of workers and theft of their hard work. Institutions such as marriage are extensions of business according to Marx, because people do not marry out of love but for financial reasons. And religion is nothing other than a ploy to keep workers quiet and justify their oppressed and unfair state – ‘religion is the opium of the people’. Karl Marx believed that because we produce so much, corporations should redistribute wealth so that there is enough for everyone. All of these issues can be reasons why people may experience mental illnesses such as depression or anxiety. The work of a psychologist is therefore crucial especially in the work place. Most employers now put effort into making sure that their staff are mentally well by hiring professionals to monitor their mental well-being. After all, communism is not just a theory. In an emotional sense all human beings belong in the world and no one should be cast out. To see Karl Marx’s tomb, you have to pay £8 for a ticket. If would like to visit, the closest tube station to Highgate Cemetery is Archway (northern line).